Aware that dispensing is found among all industries during manufacturing process, Gentec put at your disposal its expertise of dispensing and dosing fluids in a precise and repeatable way. 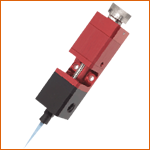 Gentec allows you to choose between two dispensing technologies: time pressure or volumetric. 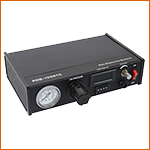 Time pressure dispensing is a dispenser of PDS range equipment, specifically designed to answer your application needs. We also offer you the only patented dispensing system and the most accurate on the market. A dispensing system 100% French, which is insensible to viscosity variations. This dispensing system guarantees a constant and simple dispensing. Gentec makes a point on providing customer care and our priority is your satisfaction. How do I choose between time/pressure and volumetric? Each application is different, our experts are available to help you find the most appropriate technology to your specific needs. Please do not hesitate to contact us if you need further information. A wide range of volumetric dispensing systems compatible with all sorts of fluids (from the most liquid to the most viscous ) combining velocity and accuracy. 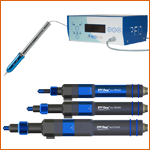 Gentec offers you applicators at a constant rate and a dosing time pressure which allows you to respond as accurately, technically and financially to your application.